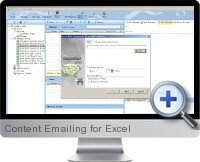 Excel Content Emailing (GoGoMail) is a standalone application designed to streamline the management and process for email Excel content to multiple recipients. The Excel content emailing allows the establishment of rules for defining content from within a single file or combining content from multiple files and send as attachments to specified email addresses or lists. The application integrates directly with any POP3 and SMTP capable email exchange server including Outlook and internet email accounts. Attachment allocation features define mappings between Excel file attachments and recipient properties to send the same content to multiple recipients in batch. Data allocation allows specific content within Excel files to identified and extracted to be sent to specified users within the body text of emails. Excel data conversion provides the ability to extract content within multiple Excel files and merge as a one file attachment for emailing to multiple users based on defined rules. Merge and split features allow content within an excel file to be segmented and emailed to separate recipients and content across files to be merged and emailed. Conversion options allow Excel content to be sent in HTML format and large data content converted to CSV format to reduce attachment file sizes.